Joint dysfunction occurs within the joints become stiff and painful movement is restricted. It may cause by an injury, poor posture, overuse or under use of the joint, muscle imbalance, as well as factors like arthritis. Joint dysfunction can cause pain in the joints or any muscles, and cause problems in other parts of the body due to overcompensation. Using specific manual or instrument manipulation to the affected joint can often return proper mobility and relieve pain. 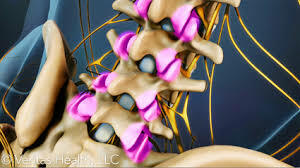 Intervertebral discs are positioned between the vertebrae in the spine. The outside of a disc is made from cartilage, and in the center is a jelly like material. These discs serve many purposes, including allowing movement of the spine, creating space between the vertebrae, and acting as shock absorbers. The gelatinous middle allows the disc to compress and expand based on impact and movement. 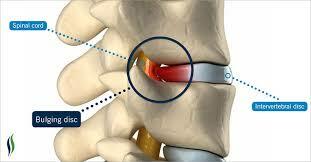 Trauma to the spine can cause the discs to herniate, bulge, become displaced (slipped disc), or even rupture. Trauma or direct injury to the area is not the only cause, however. As we get older, the discs can begin to weaken and dehydrate. These conditions can put pressure on the nerves around the spine and cause pain. If you suffer from one of these injuries you should be properly evaluated to see if a trial of conservative treatment can help your condition. In many cases, you can experience relief from disc herniation pain through conservative treatment. By performing exercises that reduce the disc herniation, pressure can be relieved on nerves and on the discs themselves. This will reduce and hopefully eliminate your pain and discomfort and allow you to live a normal lifestyle. In cases where patient's have a large herniation, Dr. Simmons, comanages these cases with a medical pain management specialist. In some cases, an MRI of the spine is ordered to further evaluate the size, type and location of the herniation. Dr. Simmons has completed a diplomate program in chiropractic neurology and a fellowship program in mild traumatic brain injury and rehabilitation from the American College of Functional Neurology. Concussions are diagnosed using the Vestibular Oculomotor Screening (VOMS) tests. These test are 90% accurate in diagnosing concussion. If the testing suggests that the individual has experienced a concussion, a complete chiropractic, orthopedic, neurological, and vestibular examination is performed to find the which areas of the brain, brainstem and spine are dysfunctional. Then, based on the process of neuroplasticity (the brain and nervous system can strengthen with stimulation and exercise) a treatment plan is designed for each individual. Each concussion injury is unique to itself and no two patients are the same. Examination includes evaluation of gaze stability, saccades, pursuits, optokinetic reflexes, motion sensitivity, balance, postural control, VOR gain, dynamic visual acuity and cervical spinal tenderness and biomechanical function. Whiplash is a common injury for people involved in car collisions. When a car is struck from behind or collides with another object, it causes the neck to snap back and forth violently. This causes the muscles and ligaments to overextend, leading to strains and/or tears. This is referred to as soft tissue damage, and can cause stiffness and pain . Whiplash can also cause structural damage such as fixated vertebrae, herniated, bulging or ruptured discs, or nerve damage due to the overextension from the violent movement. Chiropractic can help with both types of injuries. When appropriate manual or instrument manipulation can be performed specifically for those who have been in car accidents and suffered from whiplash. Stimulation of pain dampening joint mechanoreceptors through manual or instrument manipulation can restore normal spinal movement and relieve pain. Chiropractic treatment can be used to help relieve the pain and discomfort from soft tissue injuries. If you have been in a car accident, schedule an appointment with us for a thorough examination. Arthritis is a condition that is caused by the wearing down of the cartilage between joints. Some of the major joints that are affected are the knees, hips, back, neck, and hands/wrist. Arthritis can be painful and can cause the affected areas to not function properly. Arthritis in one area can cause other problems in a different joint. For instance, if you have arthritis in your left knee, you may compensate for this by putting more pressure on your right side, leading to right hip problems. Pain killers can provide temporary relief, but it is not a long term solution. Chiropractic can often alleviate pain by restoring proper joint movement, helping to ensure that you use proper motion so that you do not cause injury to other parts of your body. one of our goals is to restore and maintain proper movement and functionality to increase your overall well being. Headaches can be caused by improper motion of the vertebra in your neck. These are termed cervicogenic (neck origin) headaches and are often relieved through manual or instrument manipulation of the neck vertebra. Dysfunction in the neck joints can also be a trigger for migraine type headaches. In many cases cervical manipulation can reduce the frequency, intensity and duration of migraine headaches. Myofascial Trigger Points or tender areas in specific muscles, especially the sternocleidomastoid, subocciptals, occipitalis, trapezius and splenius capitus can contibute to headache pain. During your examination each of these muscle groups will be checked for tirgger points. If trigger points are found our therapist will teach you how to erase these painful trigger points. Sciatica is a condition that results when the sciatic nerve becomes irritated. Bulging discs, bony compression from foraminal stenosis, and muscle spasms can all cause increased pressure on the sciatic nerve. When this happens it you may feel pain, numbness, and weakness in the lower back and leg. To properly treat sciatica the cause of the condition needs to be diagnosed and properly treated. We can often help with this condition. When a nerve is squeezed or compressed it is called a "pinched nerve". Like sciatica, this can be caused by spinal stenosis, bulging or herniated discs, or other factors. The increased pressure on the nerve causes inflammation, pain, in some cases tingling, numbness or weakness. The pressure on the nerve must be relieved in order to alleviate the pain. An examination can help reveal the cause of the pain. Different treatment approaches can relieve the pain by removing the pressure. This condition is most commonly associated with people who are constantly using a computer. Typing is a motion that, when performed repetitively and with poor posture, can cause carpal tunnel syndrome. Symptoms include pain, numbness, weakness, or a burning sensation. The nerves in the fingertips travel through the wrist, up the arm, and into the neck. The spine is the center of the nervous system, and the pain in your hands and wrists can be relieved by spinal and joint manipulation, soft tissue work and rehabilitative exercises . We have discussed many conditions that can be relieved through chiropractic. The best way to treat these conditions is to prevent them before they even start. Regular chiropractic visits can help to prevent physical problems and injuries from occurring. Other potential benefits of regular chiropractic visits are increased flexibility and mobility, higher level of energy, improved posture, more effective and an overall better feeling of well-being.